When you become one of Dr. Lafemina’s patients, you can count on complete and comprehensive dental care. This includes a focus on periodontal health. Your gums and underlying jaw bone are the foundation of both your teeth and your oral health, which makes caring for them essential to our oral health. When you visit us for each of your routine dental appointments, your gums are checked thoroughly and gently. If there are any signs of early gum disease, scaling and root planing, also known as “deep cleaning,” is suggested. Dr. Lafemina may prescribe antibiotic treatment or mouthwash to use for a couple of weeks after the procedure. Should you require surgical intervention, Dr. Lafemina works closely with a top local periodontist who provides advanced gum disease treatment. This care includes tissue grafting, gum regeneration therapy, and several other surgical interventions. Coordinating periodontal services with the specialist ensures that you are receiving the best possible treatment. Our dentist is kept up-to-date on your treatment with our specialist. Dr. Lafemina also provides all pertinent dental information to the periodontist, so they have the full picture of your oral health. Gum disease can progress quickly if left untreated. If you have any underlying health conditions, potent and abundant oral bacteria can travel through breaks in soft-tissue of your mouth to other areas of your body. 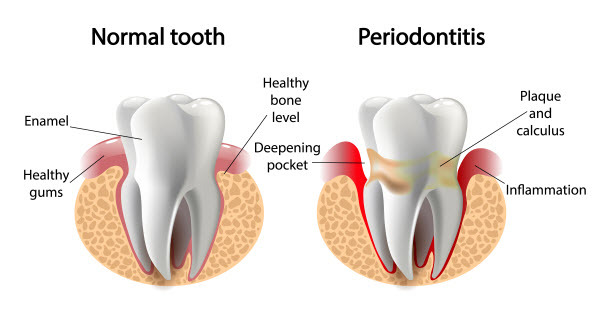 Diabetes can both contribute to periodontitis and be exacerbated when gum disease is present. The heart and lungs are often affected, and oral bacteria has even been associated with dementia and premature childbirth. Caring for your teeth and gums properly and having your teeth professionally cleaned every six months is necessary to prevent tooth decay, gum disease, and tooth loss.